This morning I had a Green Eggs and Ham breakfast! 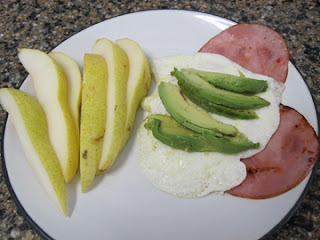 "Green" being- pear and avocado, with eggs over easy on Canadian bacon. It was a great breakfast and a nice break from the scrambles I've been making all week (and really for the last 3 months)! It was rich and very very filling. It should do a good job of keeping me satisfied through all my Christmas shopping errands today. For lunch we are headed to in-n-out for a protein style burger. I will be home tonight making some delicious coconut soup and cauliflower fried "rice", so check back in for some recipies!